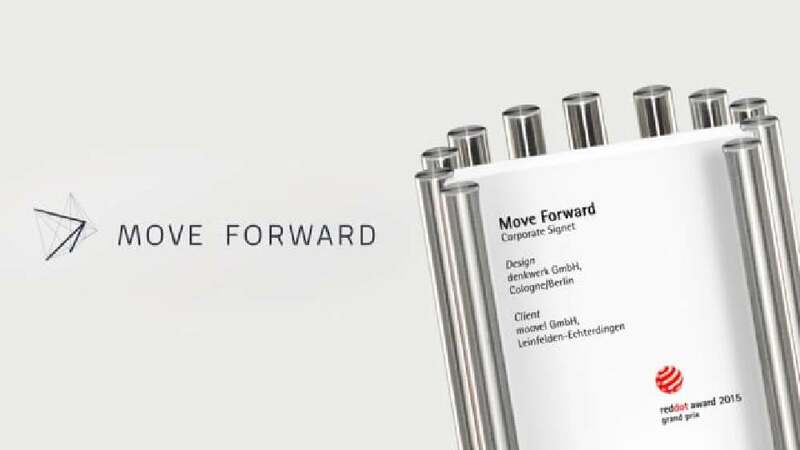 “Move Forward” is a platform where people from all around the world can collaborate and exchange ideas on the major topics and challenges of mobility. Facing the question of how to embody an issue in a logo, if the issue itself is constantly on the move, the logo for this platform was created as animated logo using data such as CO₂ emissions, energy saved and traffic data from Google to visualise movement itself. The result is a logo representing long-term trends just as the very moment itself, whilst always pointing in one direction: forward. Based on the principle of “tensional integrity”, the logo’s calculative structure is visible in the background, while three connecting lines stand out in the foreground, forming an arrow that points the way forward. Although this arrow has a random appearance, its real-time calculation follows a precise isometric raster caught within a helix. A font representing a well-balanced mix of the “good old” and the “clean new” lends the logo an uncluttered finish, underlining the progressive technological approach. The design idea of this graphically animated logo is outstanding. Created for a platform focusing on the future of mobility, it is based on user data and thus is constantly on the move and changing. By using real-time data of the actual surroundings of the users, the dynamic logo always points forward. Never repeating itself and thus remaining always unique, the logo reflects the platform’s intention in an exceptionally innovative way.